Gnocchi is one of the best comfort dishes. 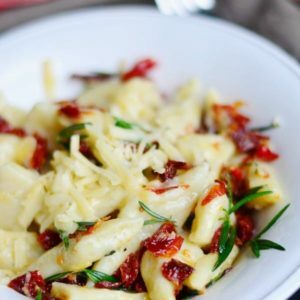 Soft, fluffy pasta made with potatoes and you can make an endless variety of dishes with it. You will need plenty of work surface so clear out a counter! When potatoes are cooled enough to be handled, place them in a mount on your work surface. Add flour, salt and pepper over the top. Make a well in the potato/flour mount and crack the egg in the middle. Use a pastry scraper, or a metal spatula (or even a knife, carefully) to work flour, potatoes and egg together, until incorporated enough to knead. Knead the dough, adding a little more flour if the dough is too tacky, until smooth. Don't add too much flour, the dough should be moist but not sticky. Gnocchi should be cooked right away or frozen. Cook: bring a pot of salted water to boil. Drop desired amount of gnocchi in it and once they float to the top, cook for about 2 more minutes. Freeze: Line large cutting boards with parchment paper. Spread out raw gnocchi on the paper (don't crowd them) and freeze for about an hour. Once completely frozen, place them into a freezer friendly, zip lock bag.